Overview: This is an upmarket, luxury two bedroom (one double and two singles), two bathroom (en suite and shower) third floor unit. This apartment has a large balcony, lovely sea views‚ overlooking the gardens and the Oyster Box Hotel -, open plan lounge and dining area and kitchen with fridge/freezer, microwave, oven, washing machine, dishwasher, tumble drier, crockery and cutlery. The unit is air conditioned in the bedrooms, and has DSTV, linen and bath towels are provided, however beach towels are not. The access to the unit is via a lift, there are two undercover parking bays. the property. The unit is serviced Monday to Saturday (excl public holidays). Overview: Accommodation at uShaka Manor Guest House offers the discerning business or leisure traveller a choice of six luxury suites, each tastefully decorated to provide the comforts that only a home can.Alternatively there is a two-bedroomed self-catering unit.A full breakfast is served at the rock pool. Laundry services and beach towels available on request. 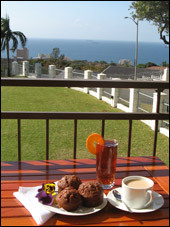 Overview: Anchor's Rest is situated in the heart of Umhlanga Rocks where all facilities are just a stone's throw away. Tropical gardens, sparkling pool, luxury accommodation and warm ambience within a 3 minute walk to the beach, shops and restaurants. Relax in a warm, hospitable environment where a delicious full English breakfast awaits you each morning. Choose between standard rooms or suites, which have private entrances, lounge and breakfast bar, en-suite bathroom and well-equipped kitchen for self-catering. Air conditioned with private patios and barbecue facilities, personal DSTV decoder, hospitality tray, fridges and secure parking. Well stocked bar with large screen TV in spacious guests lounge opening onto sea facing patio. Secure off street parking. Close to Gateway Shoppertainment Centre, business parks, golf courses and numerous tourist attractions. Overview: The spacious en-suite double bedrooms are individually decorated combining elements and colors of African wildlife, nature and sand. Each bedroom is equipped with satellite television, air-conditioning, bar fridge, hairdryer, tea and coffee facilities. Bedrooms also have private exits. each room has their own secure garage and are serviced daily at your convenience. The comfortable living room offers the perfect setting for relaxing after a busy day at any nearby golf course, historical attraction or beach. Overview: Modern, upmarket, and affordable accommodation with sea views. Spacious rooms are en-suite with air conditioning, individual satellite TV, own private entrance, lounge and breakfast nook area with fridge and microwave. Enjoy your drink and delicious breakfasts overlooking the warm Indian Ocean from your own private balcony or patio.